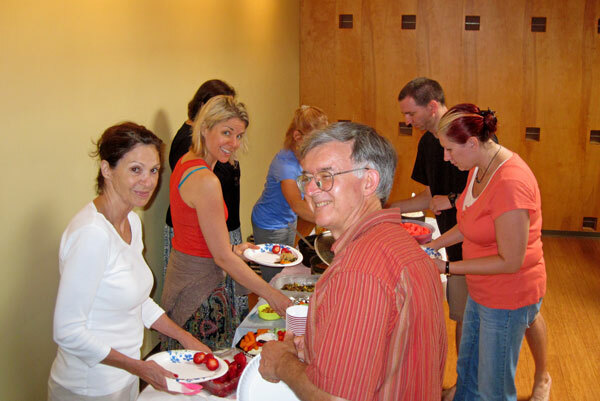 Please join us on Labor Day with family and friends for a veg potluck. We’ll share stories about our late Guruji, B.K.S. Iyengar, and how his yoga has influenced us. 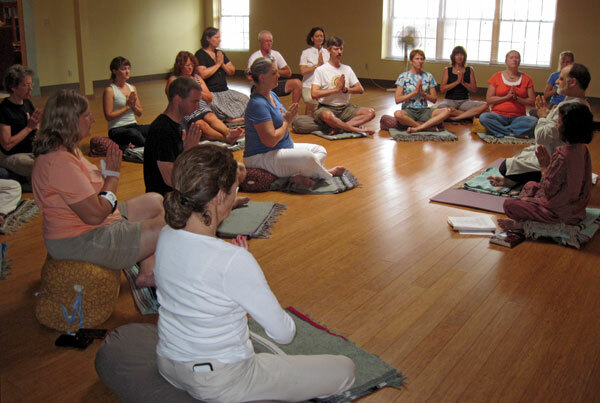 Memory has always played an important role in yoga. Even for the literate, text memorization has been an inviolable part of the oral tradition. The Vedas, composed by God, were shruti, “heard,” but the epic texts and Yoga Sutras were smrti, “remembered” by man. Memory itself need neither be impermanent nor inaccurate. The ceremonial courtyard patterns, kolam, of rice powder designed by Indian women are meant to be impermanent. When walked on, they are, of course, “destroyed.” But the women view it in a different way: the bare feet of their family “carry” the sacred elements of the design across the threshold, blessing the home. Their ritual art must vanish in order that its imprint, the samskara, remain intact. Moreover, it must be physically destroyed — not only to be remembered, but also to be reborn. 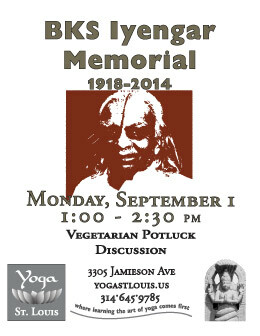 We yoga practitioners, including our late beloved Guruji Iyengar, must die in order to be reborn. Only our memories of him sustain us now. Many of you know that I have documented the work of Guruji Iyengar through transcripts and photos. You may not know that he hated when I wrote things down instead of listening. I, of course, was afraid I would never remember. But he knew that if I were truly present in that moment, I could never forget. And the things I remember best were never written down. 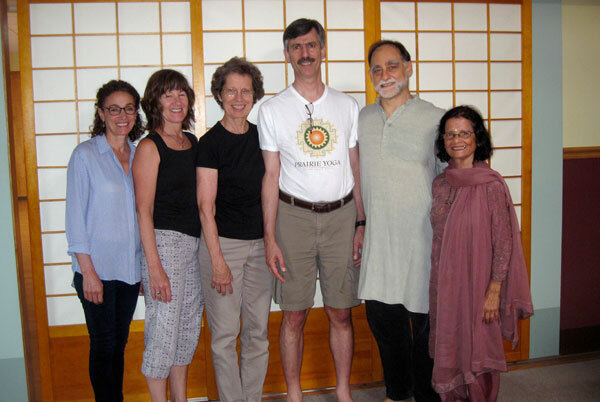 Yoga St. Louis teachers Bruce Roger and Tiki Misra (far right) lead invocation at 9-1-14 Iyengar Memorial. Clockwise, from foreground: Anne Allen, Garrick Mueller, Marie Fullerton, Jean Durel, Rae Miller, Kay Lynne Firsching, Nancy Miner, Janet Skaggs, Phyllis Hasser, Robert Gadon, Mary Kinsella, Jane Fitzgerald, Libby Kindle, Eileen Kinsella (hidden).